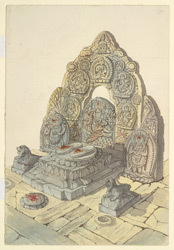 Watercolour of the footprints of Manjusri at Swayambhunath in Nepal, by Henry Ambrose Oldfield (1822-1871), dated February 1855. The image is inscribed on the reverse: 'Churan' or Footprints of Manjusri Budhisutwa at Sambhunath. February 1855', together with notes. Dr Oldfield, who was Residency Surgeon at Kathmandu from 1850-1863, wrote, in Volume I of his 'Sketches from Nipal, Historical and Descriptive...' (1880): "There are several small shrines dedicated to Manjusri and his wives in different parts of the Valley. The largest and most important is situated on Mount Manju, on the western of the two crests of the hill of Sambhunath...His shrines are generally distinguished by having opposite to their principal front a circular stone slab or "mandal", on which are sculptured, in bas-relief, two footprints (churan), across the sole of each is engraved an eye. This eye is a peculiar characteristic of of the footprints of Manjusri, and serves to distinguish it from the footprints either of Sakya Singha, of Vishnu, or of Saraswati."